Wake up to a beautiful view of the Riviera Maya. Enjoy the view then go back to bed and sleep in. Grab your daily dose of caffeine by ordering a delicious cup of capuccino in the patisserie. Then grab breakfast in Casa Las Islas. Try a traditional Mexican breakfast. We recommend chilaquiles. Don´t forget to order a mimosa, you’re on vacation after all. The first bicycle tour is at 9:30 a.m. Enjoy the natural wonders of the Tres Rios Nature Park and always remember to respect your surroundings. Take a look at our activities to catch one of our classes. Sushi? Cocktail? Mole? 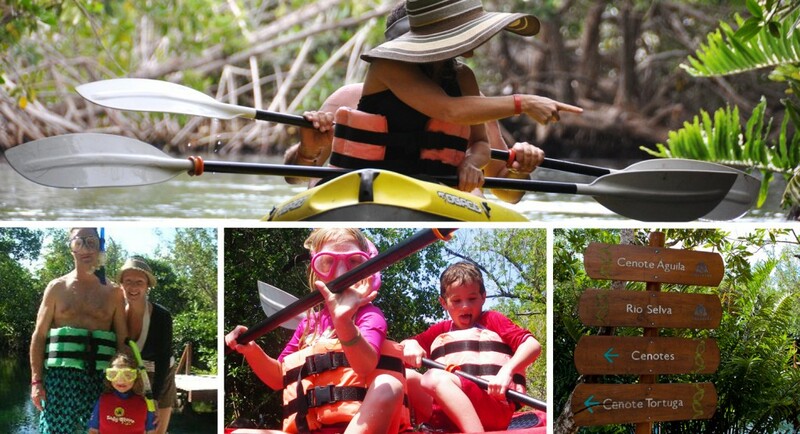 Share an unforgettable experience with your family by taking a kayak down the river or exploring our underwater world while snorkeling in a cenote. Wind down with a cocktail (or two), while relaxing on a beach bed and taking in the view. Be sure to reserve your Chef’s Table Dinner and enjoy a 7-course meal in the kitchen with Chef Oscar. Yum! And tomorrow we’ll do it all over again. Good night! Photos by Kirsten Alana and many of our guests. You have a wonderful picture of of our dear friend Oscar Orbe, your previous Executive Chef. The wonderful new Chef Mario’s photo is missing. I love the new Casa Las Islas, that Chef Mario has created. His other wonderful and talented Sous Chefs should also be recognized. Hi Brenda, this post is from when Chef Oscar was still with us. Here is a recent post about Chef Mario and our Chef’s Table http://www.haciendatresrios.com/dining-chef/hacienda-tres-rios-chefs-table/ and another about Chef Ulises and the new Alebrije. Thanks for commenting! Hope to see you soon!